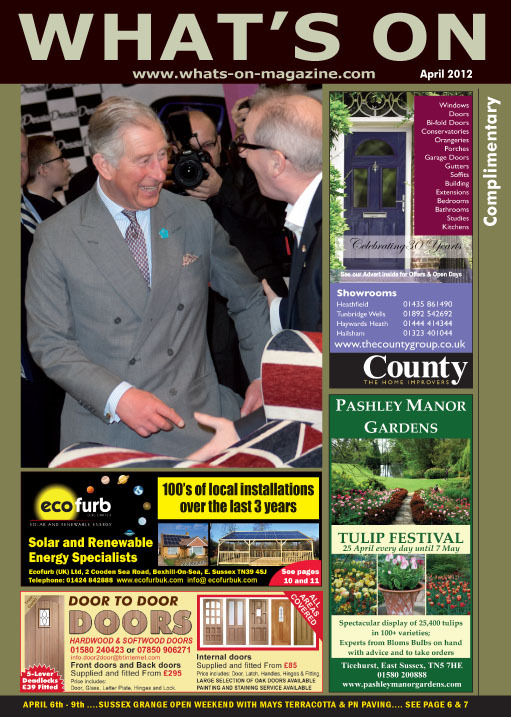 ALL EDITIONS AFTER OCTOBER 2015 CAN BE VIEWED ON THE MAIN HOME PAGE IN ORDER. 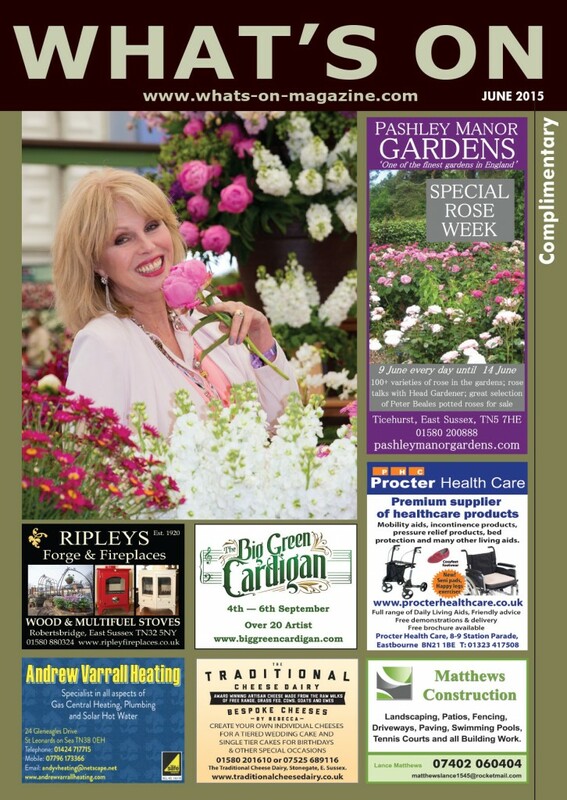 THIS KEEPS EVERYTHING TOGETHER AND MEANS FEWER CLICKS TO FIND AN ISSUE. 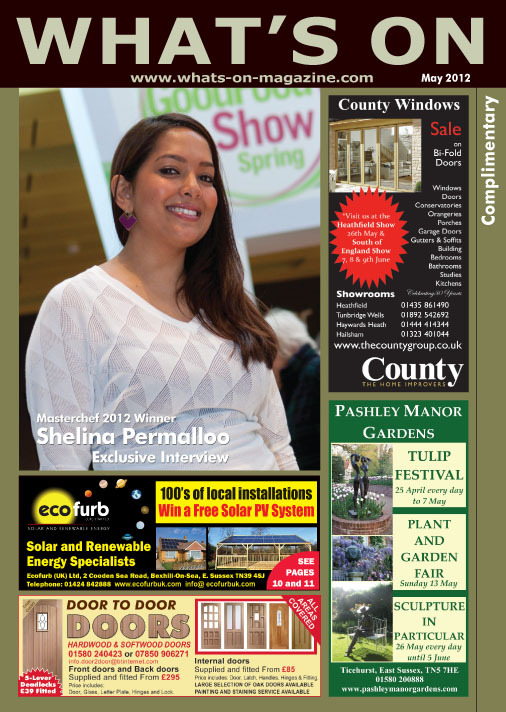 Click on the cover to read the magazine online or on your tablet. 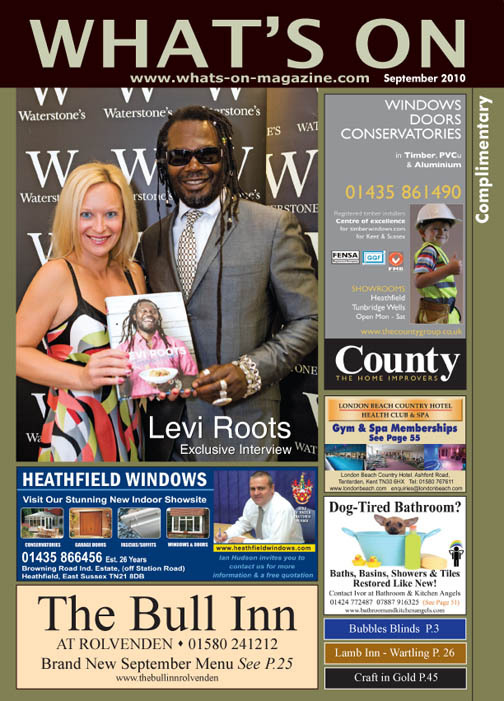 right hand corner. 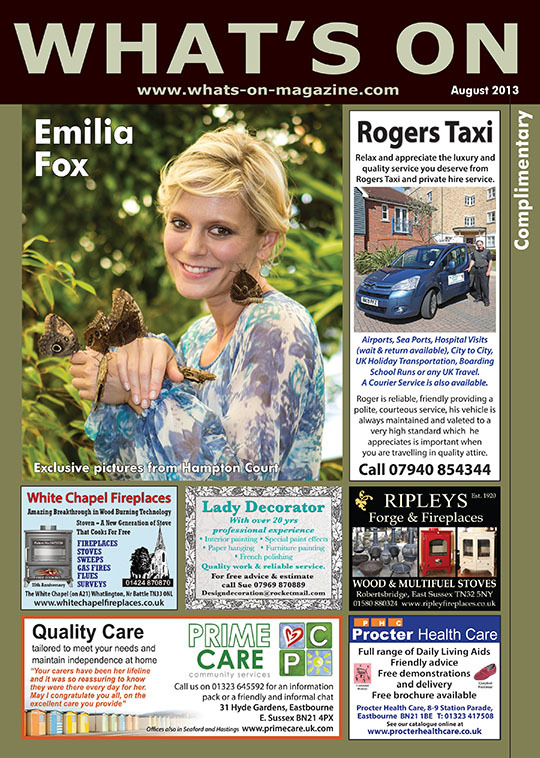 Click to zoom in, click to zoom out. 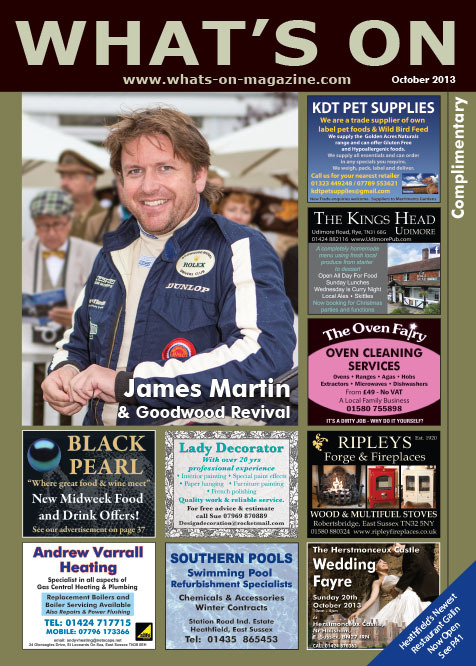 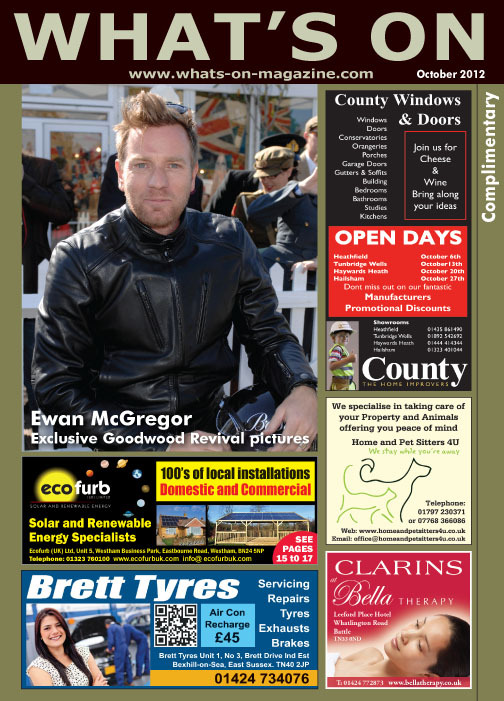 What’s On Magazine October 2015 edition features exclusive pictures from the 2015 Goodwood Revival. 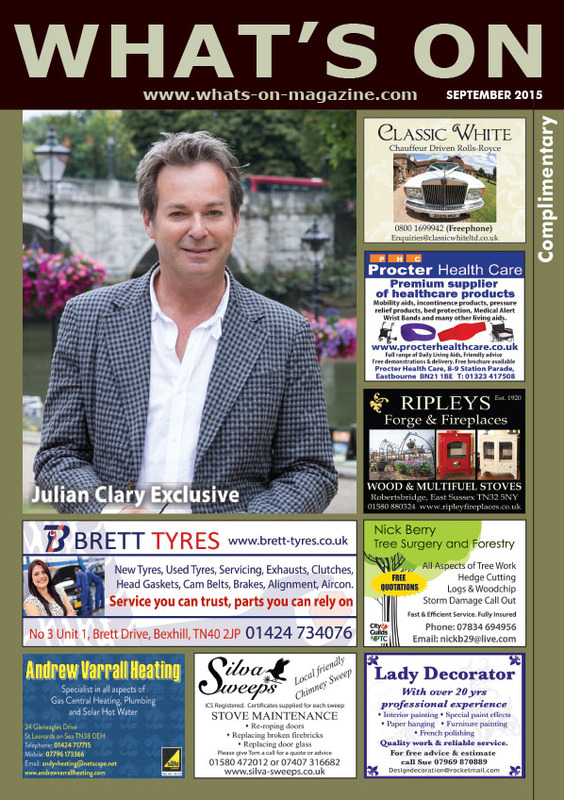 What’s On Magazine September 2015 edition features an exclusive with Julian Clary. 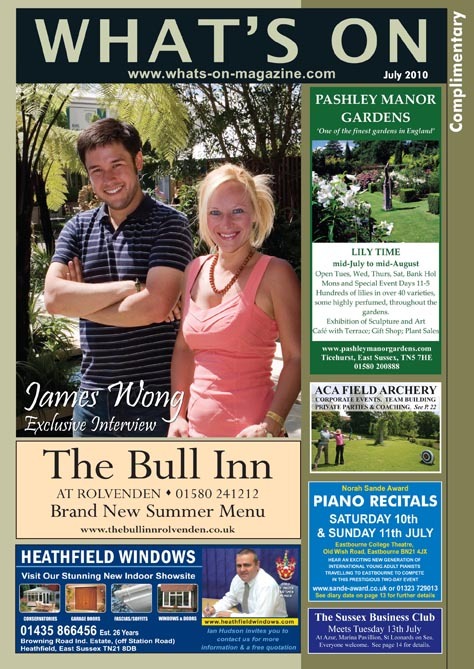 together with an interview with Paula Radcliffe. 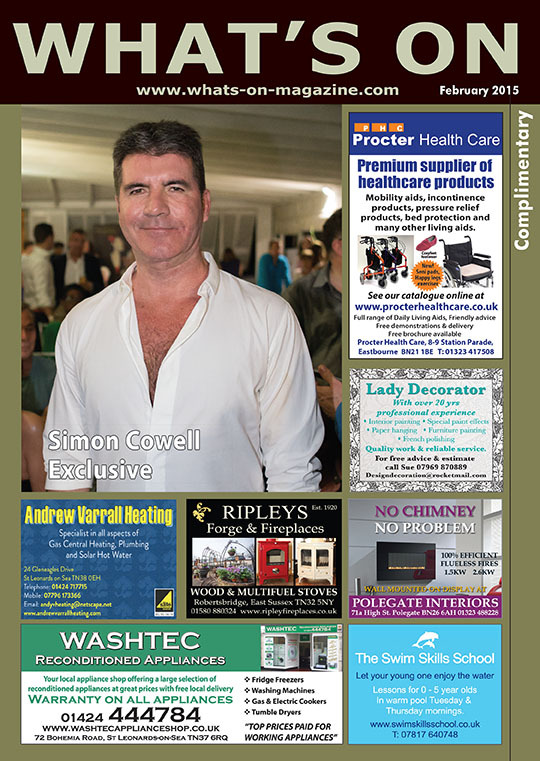 Our February 2015 edition features an exclusive interview with Simon Cowell. 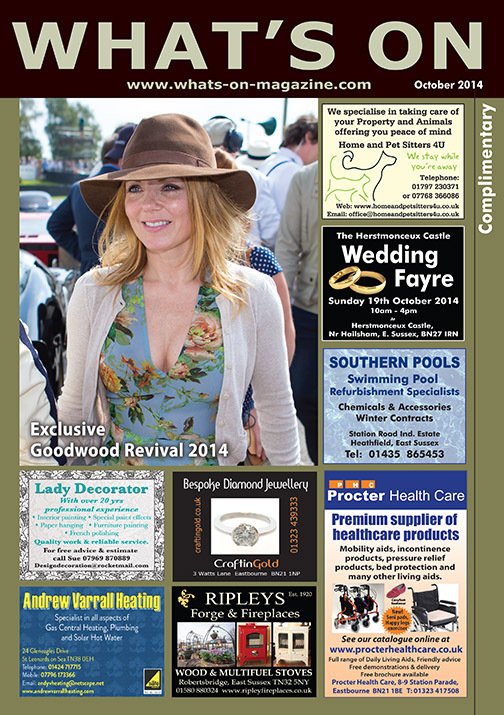 Our October edition features exclusive pictures from the 2014 Goodwood Revival. 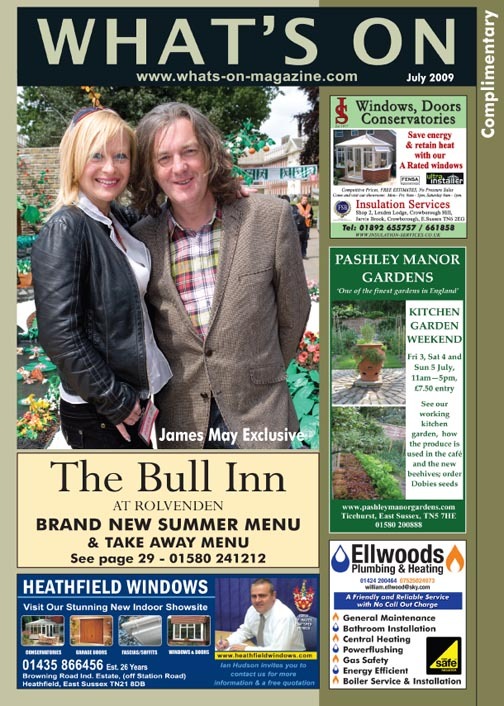 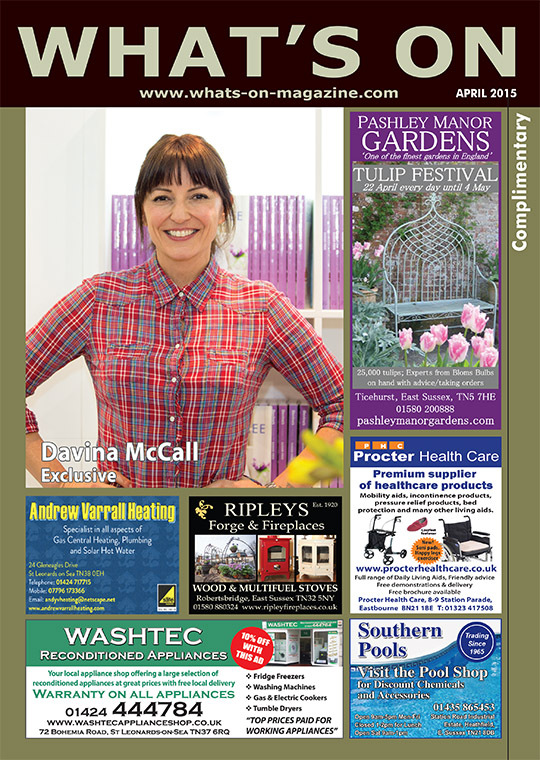 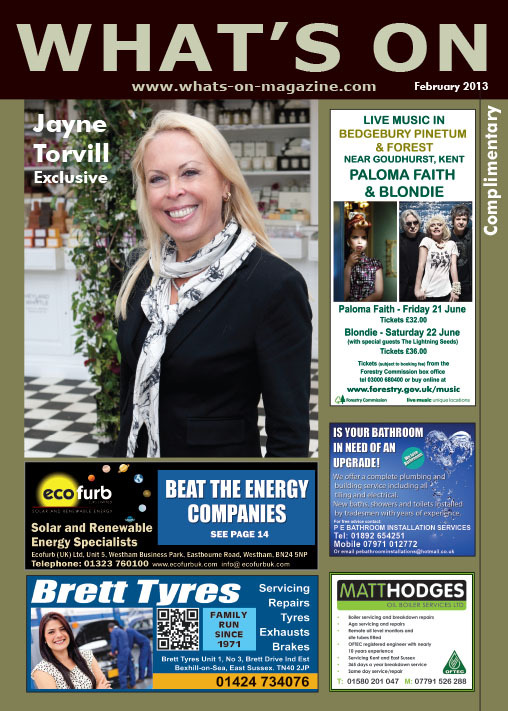 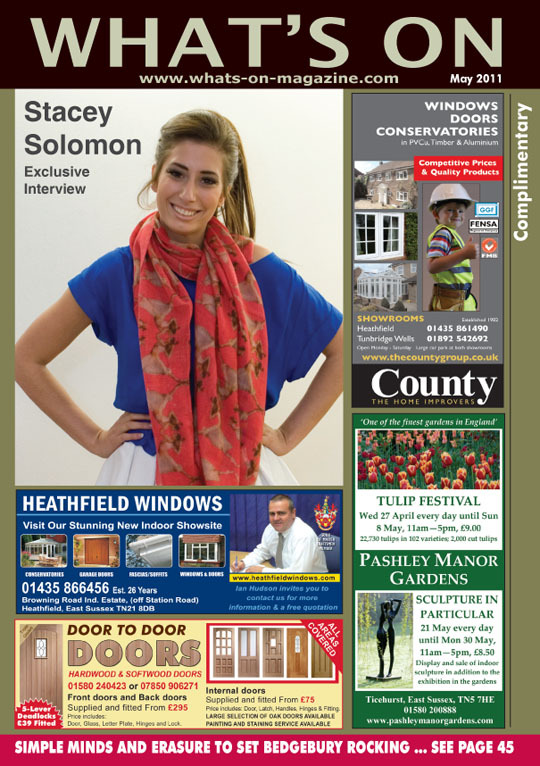 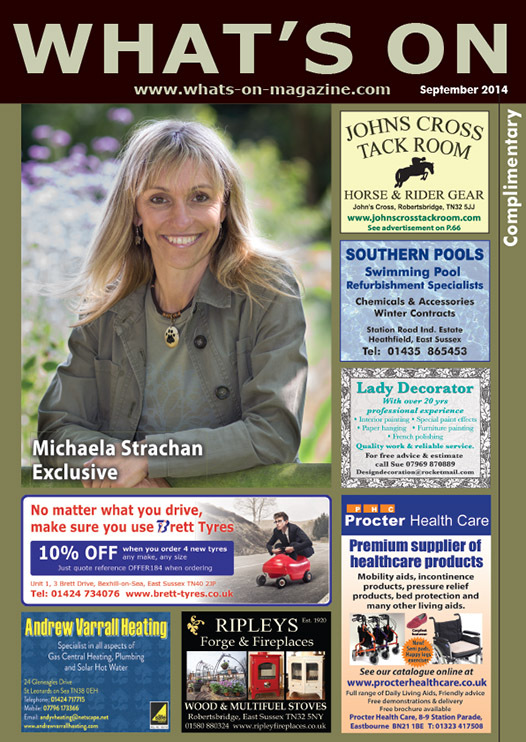 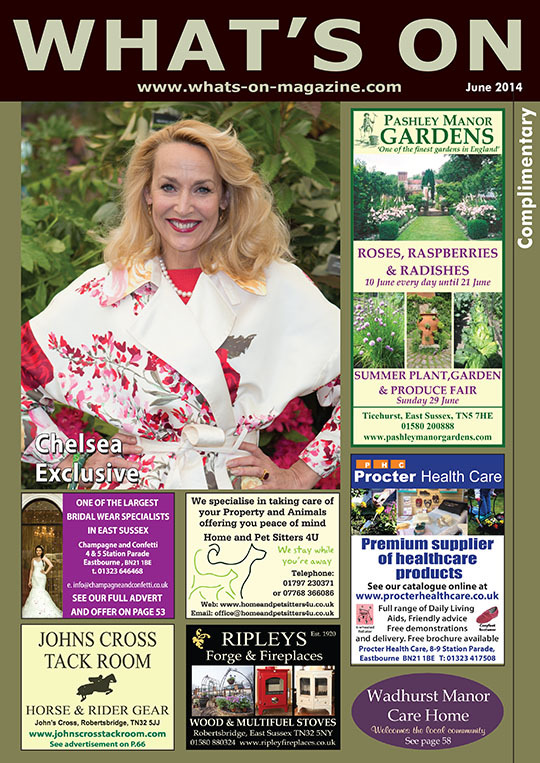 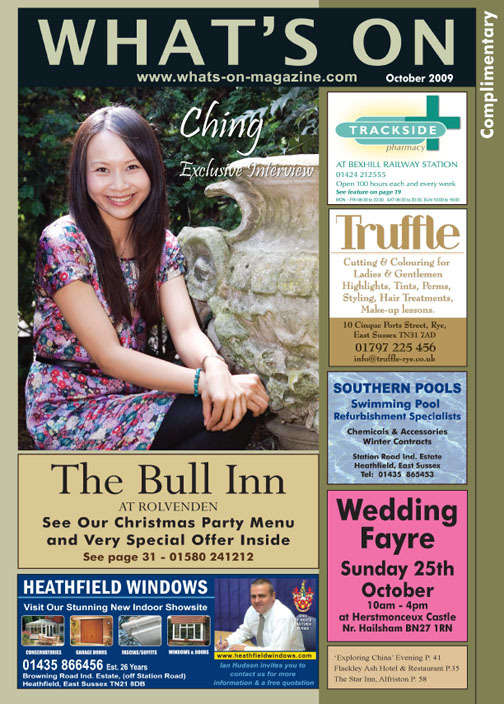 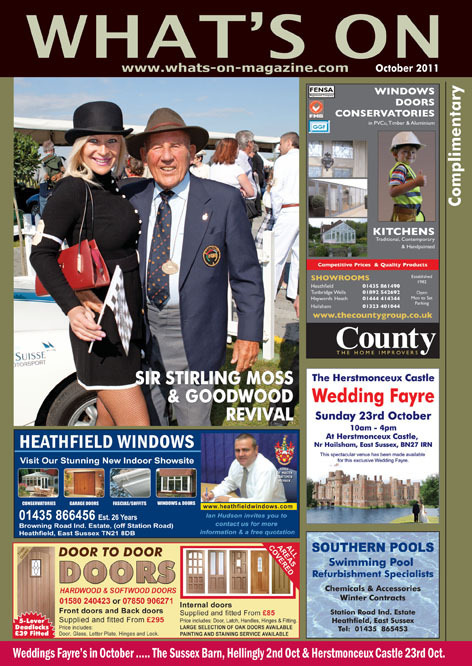 Our September edition features an exclusive interview and pictures with Michaela Strachan. 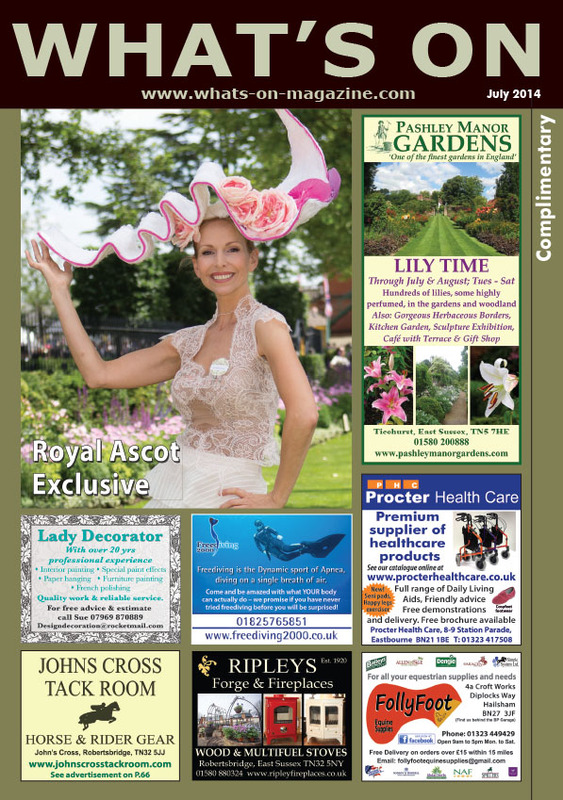 Our July issue features exclusive pictures from Royal Ascot. 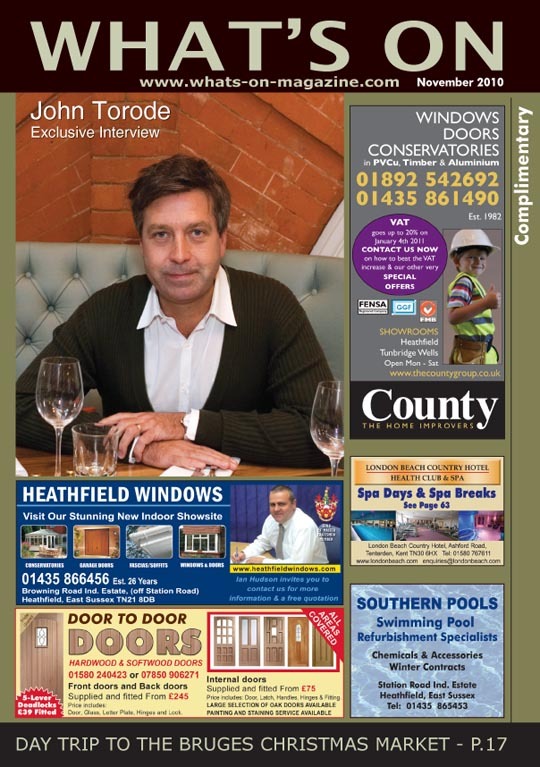 Our April 2014 issue features an exclusive interview with Laurence Llewelyn-Bowen. 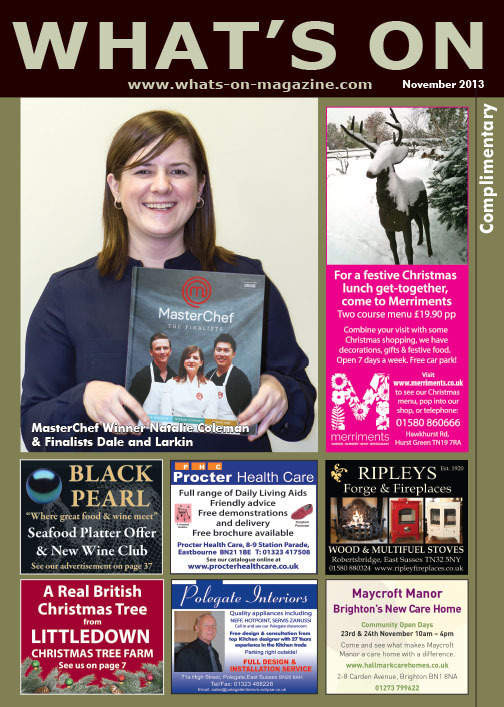 Our November 2013 edition features an exclusive interview with the MasterChef finalists. 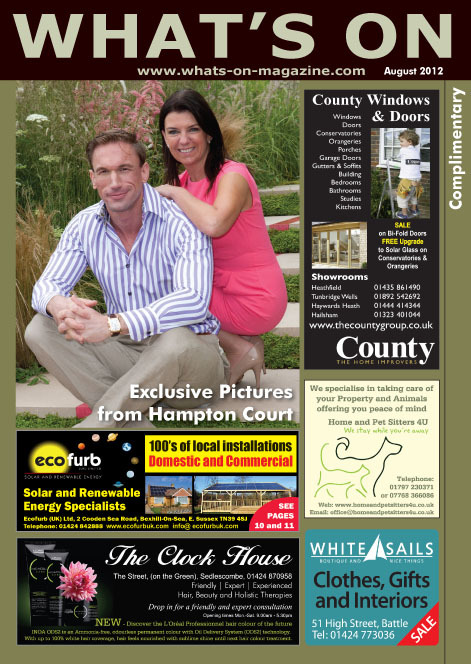 Natalie Coleman, Dale Coleman and Larken Cen. 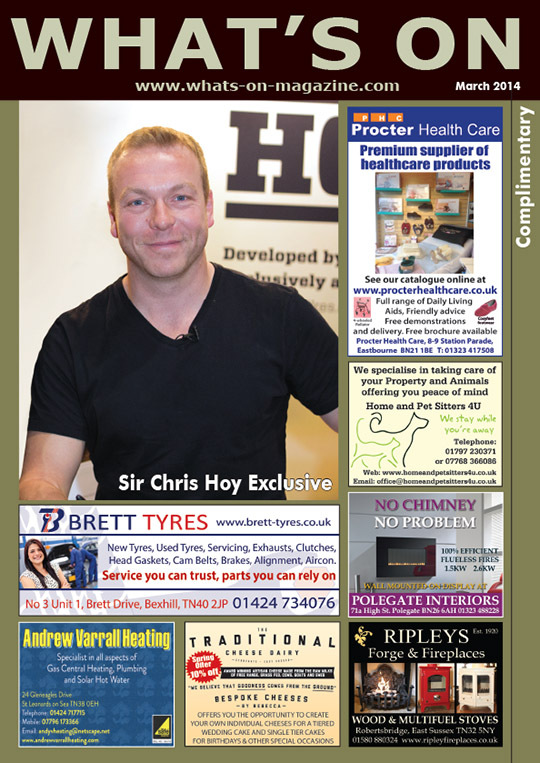 including Sir Chris Hoy and James Martin. 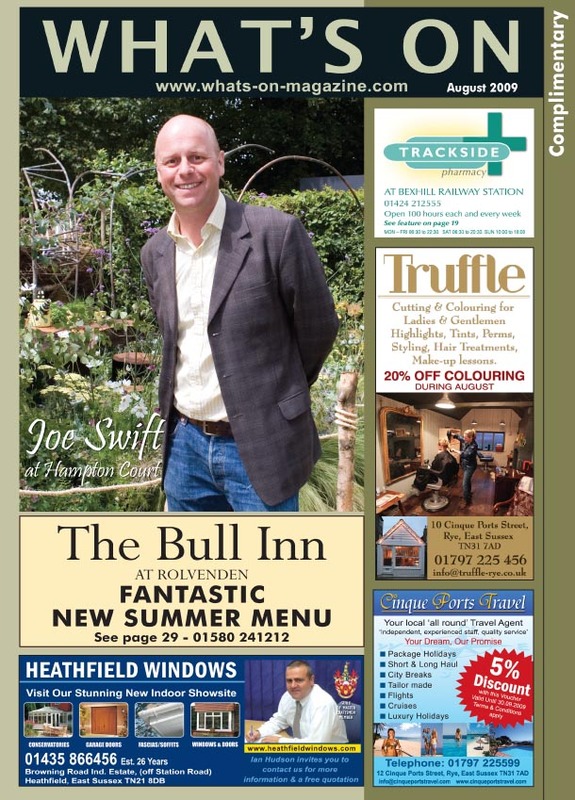 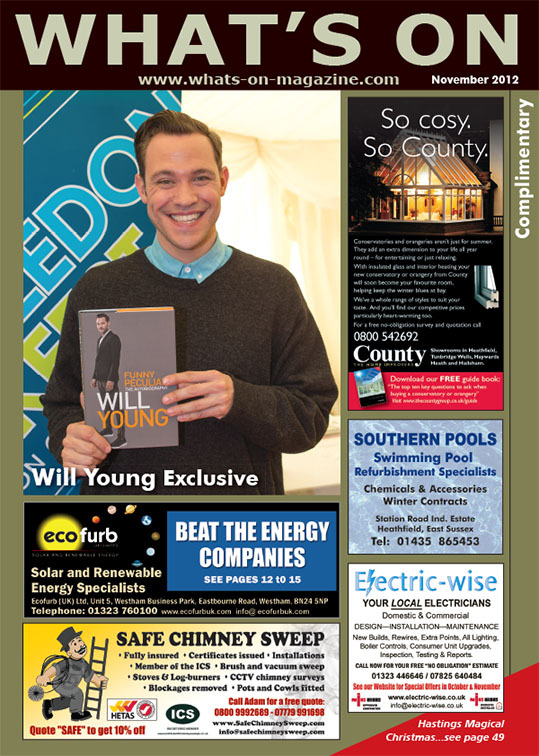 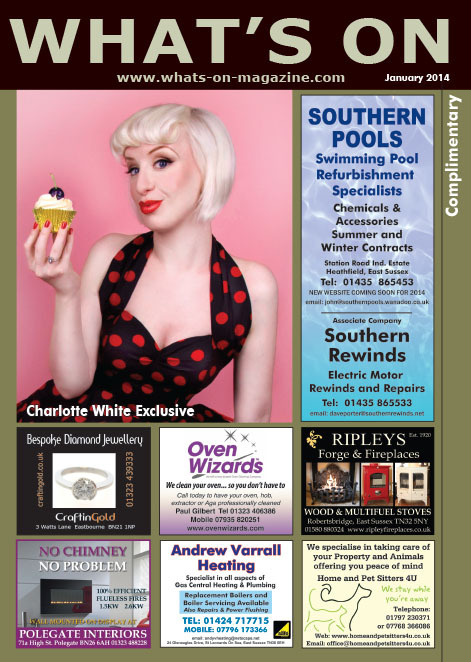 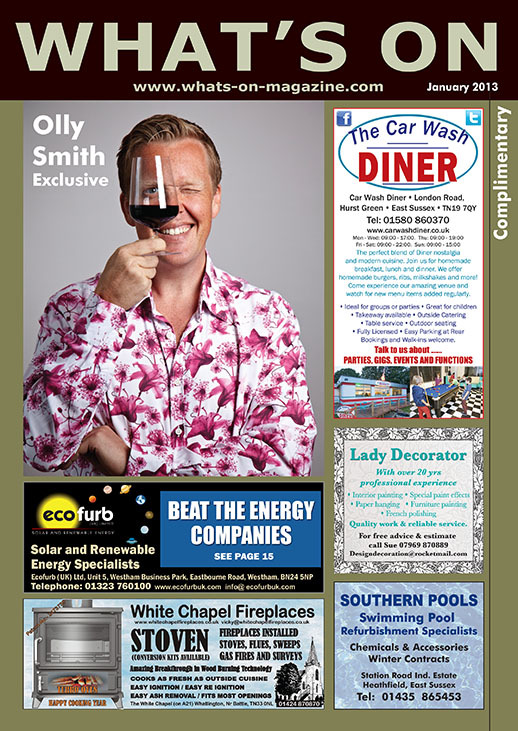 Our January 2013 edition features an exclusive interview with Olly Smith. 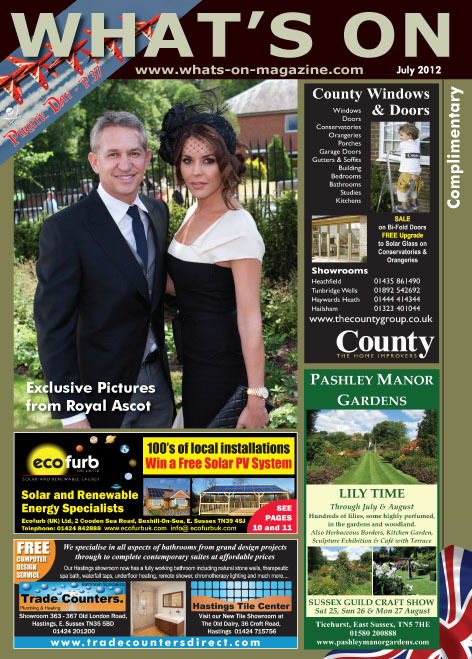 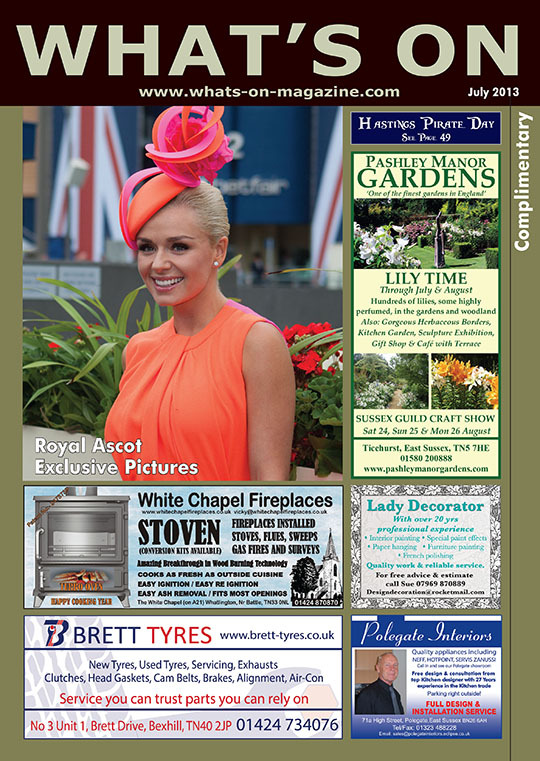 Our July 2012 edition features exclusive pictures from Royal Ascot 2012. 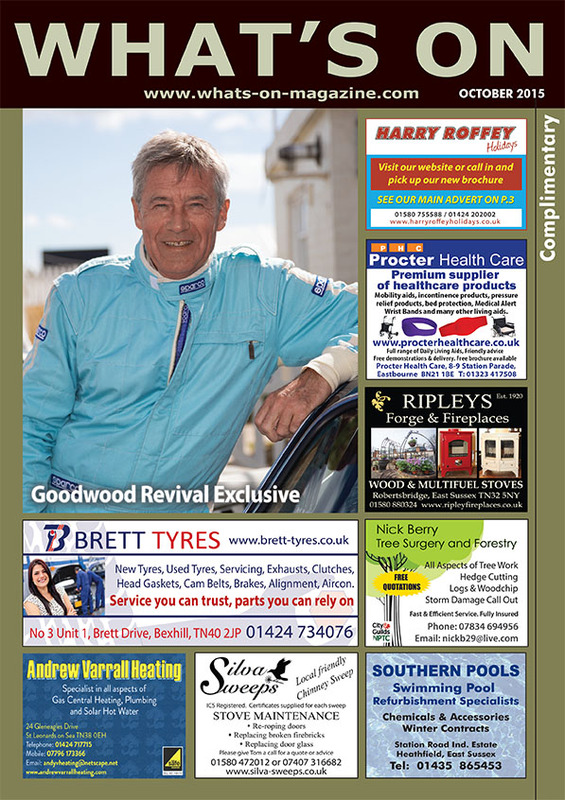 Our April Edition features an exclusive interview with Suzi Perry and exclusive pictures of Prince Charles. 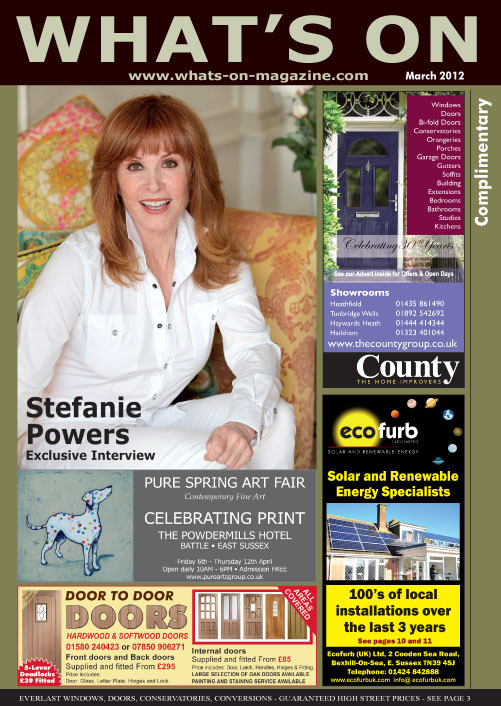 Our March 2012 edition features an exclusive interview and pictures with Stefanie Powers. 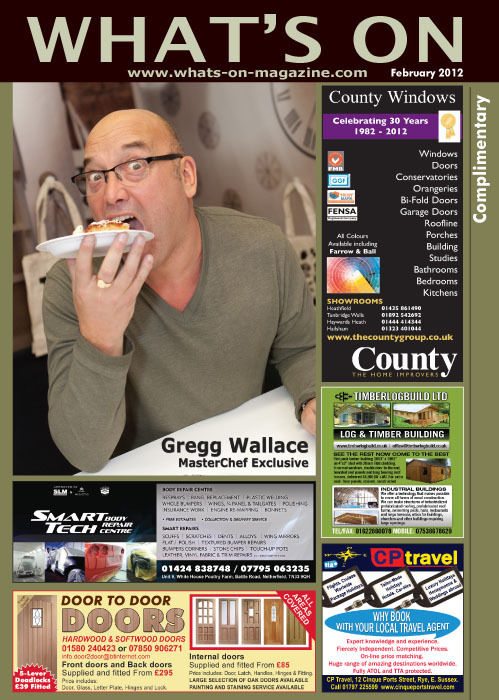 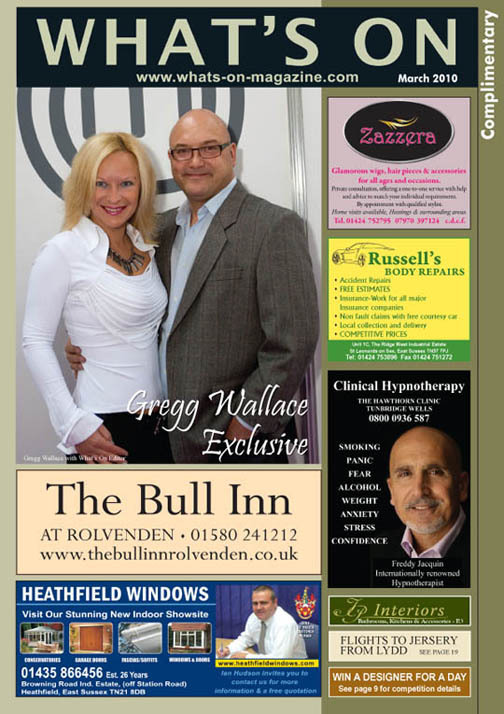 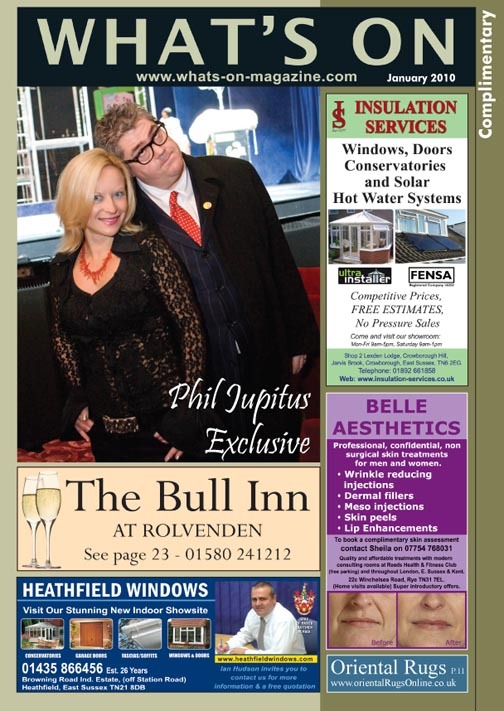 Our February 2012 edition features an exclusive interview and pictures with Gregg Wallace. 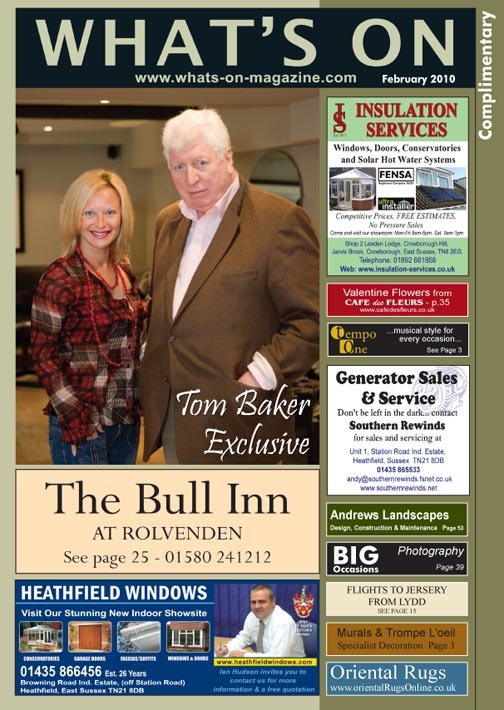 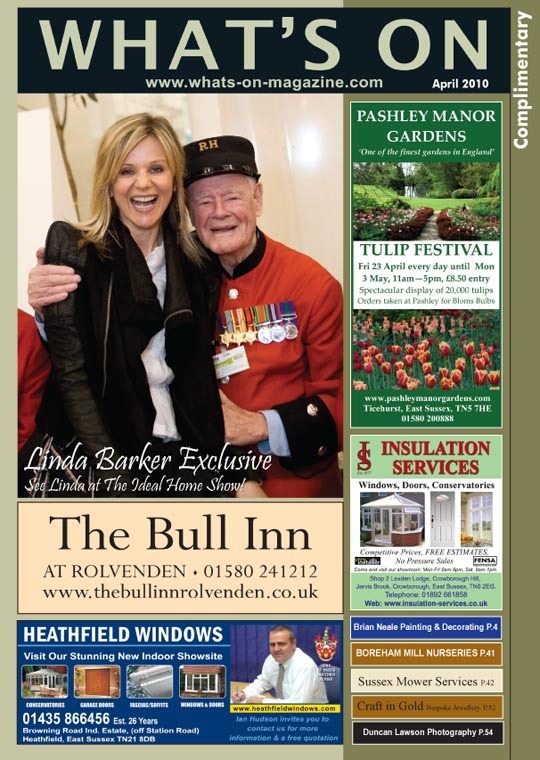 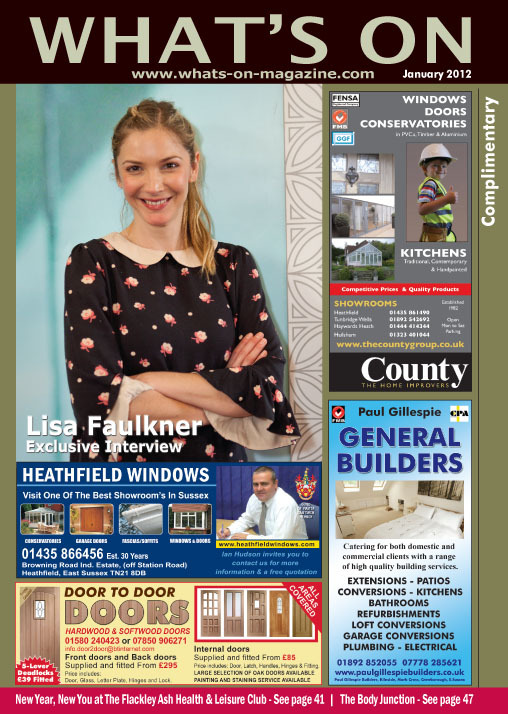 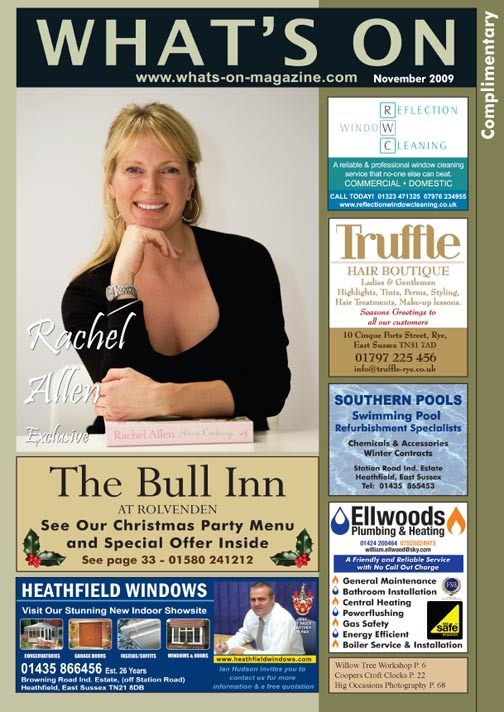 OurÂ January 2012Â edition features an exclusive interview and pictures with Lisa Faulkner. 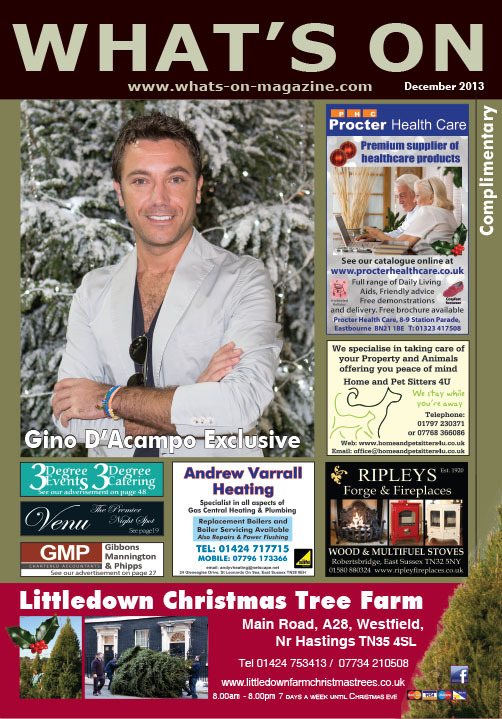 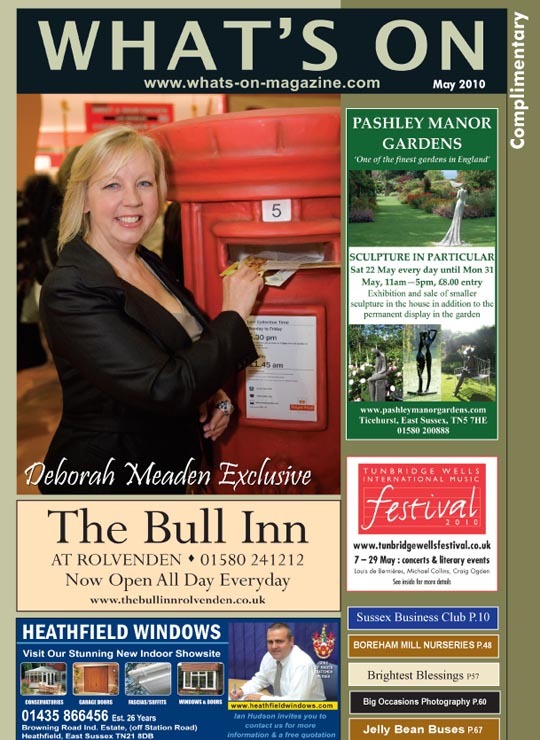 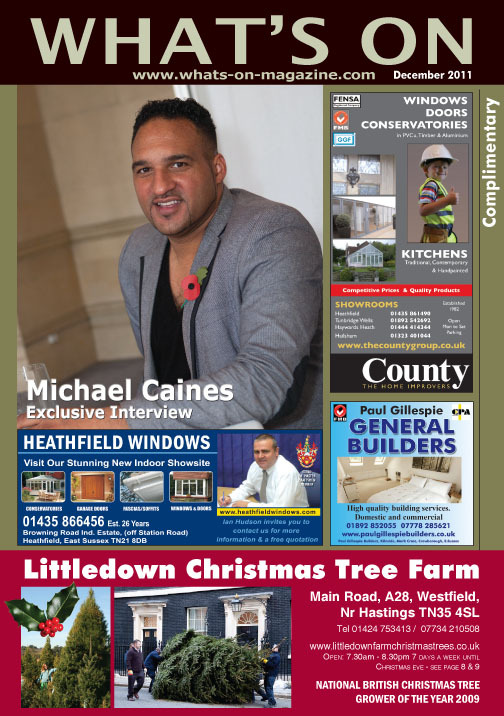 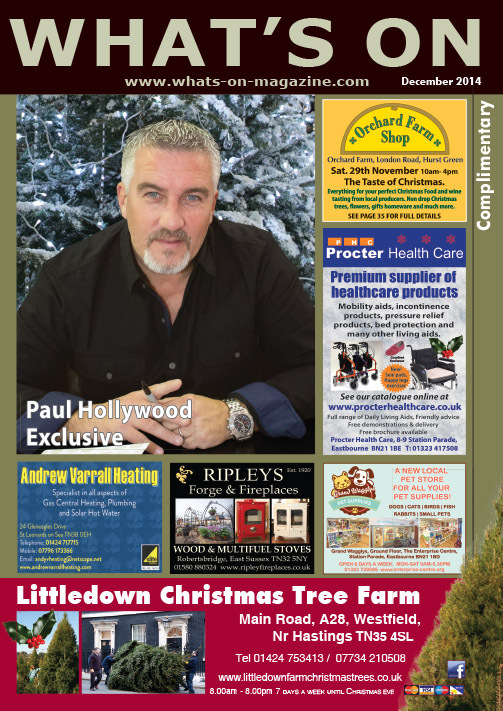 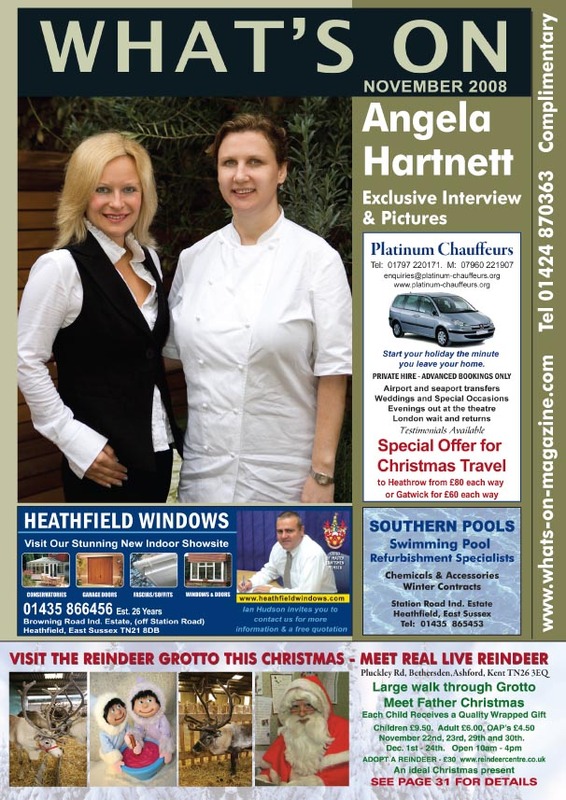 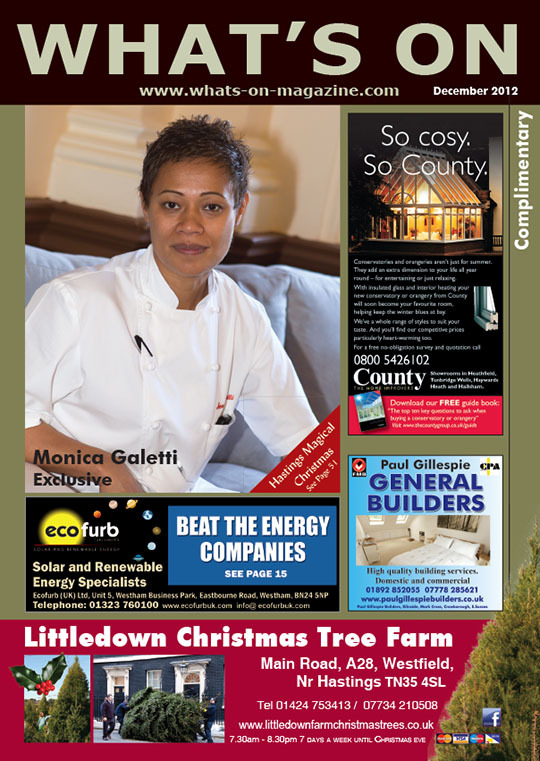 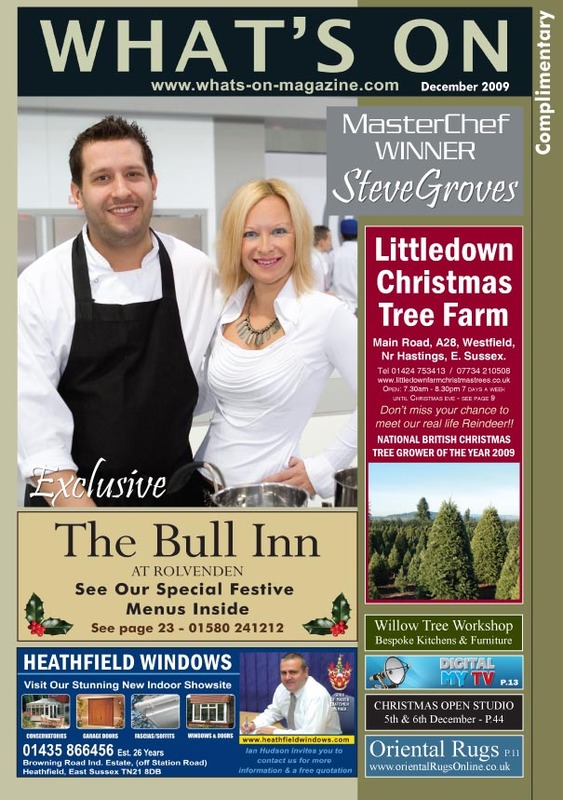 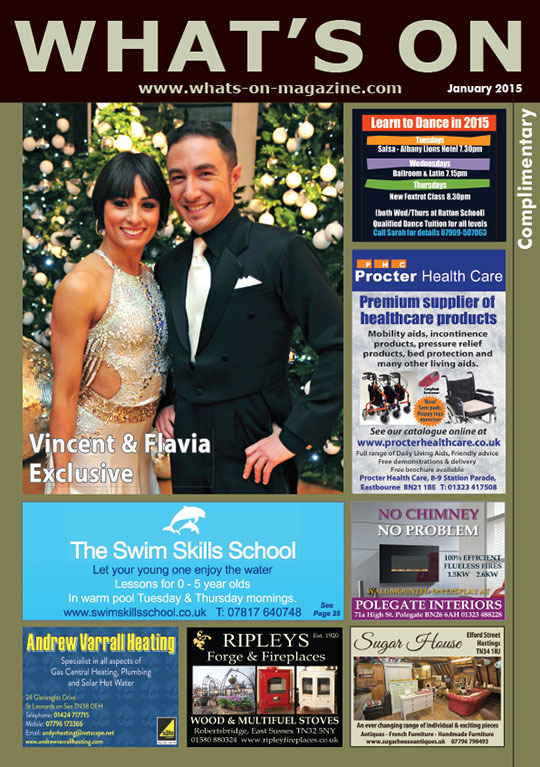 Our December 2011 edition features an exclusive interview and pictures with Michael Caines. 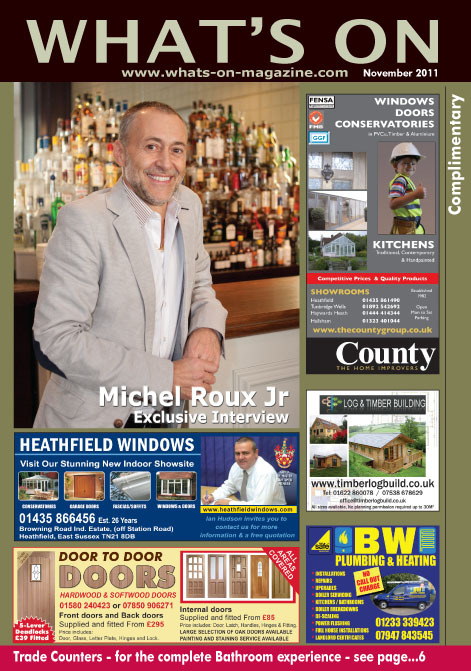 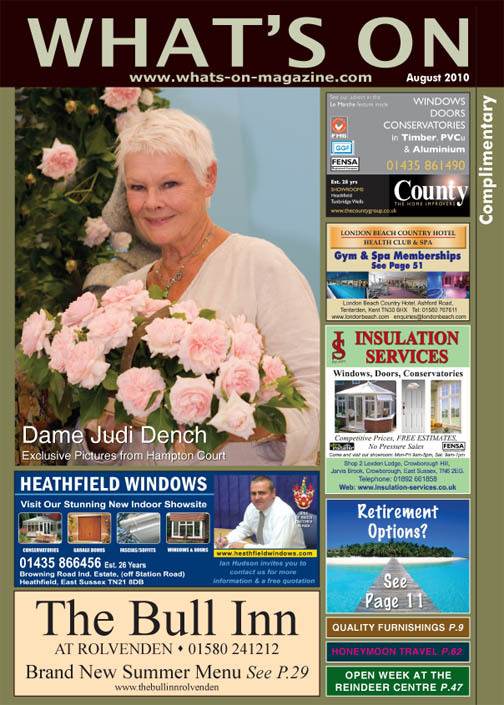 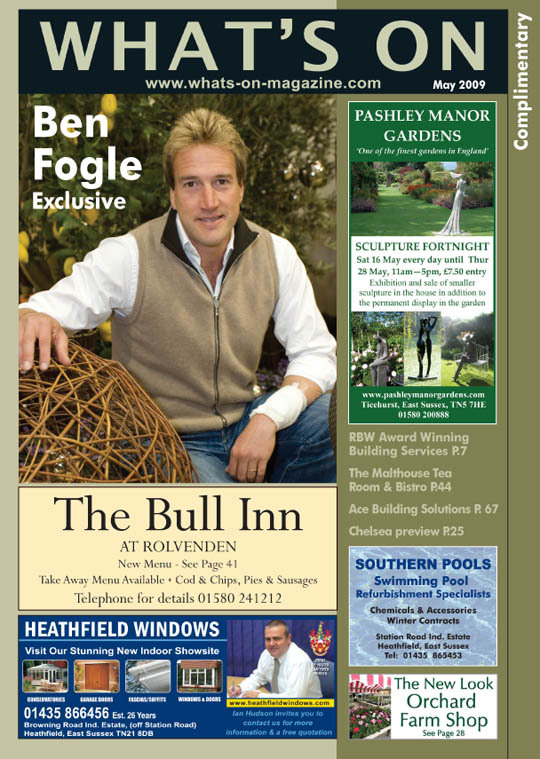 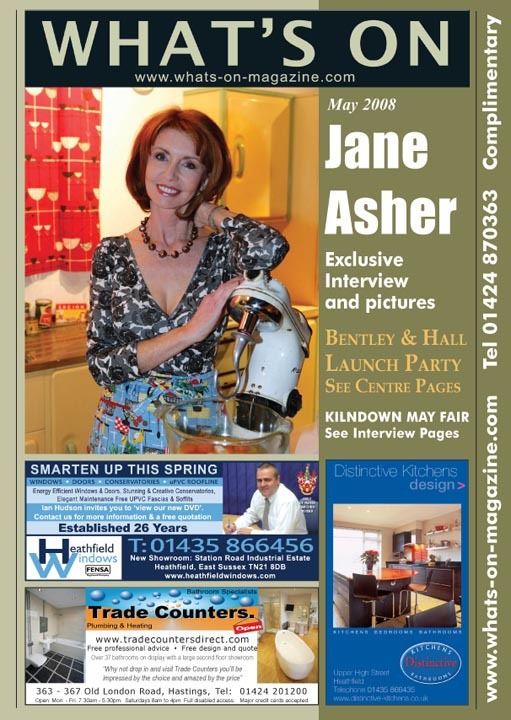 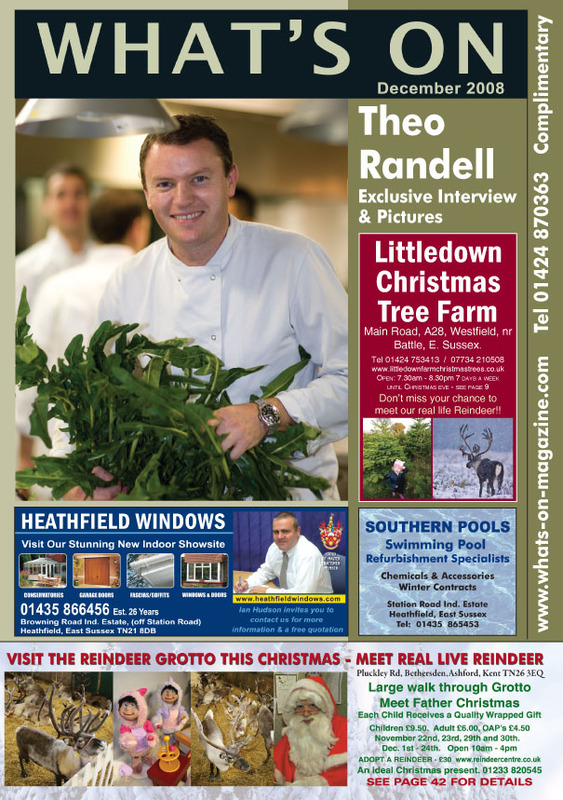 Our November 2011 edition features an exclusive interview and pictures with Michel Roux Jnr. 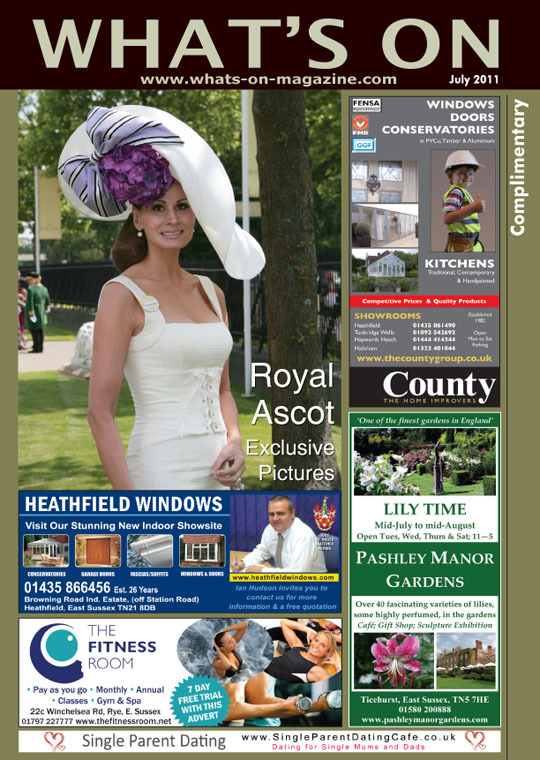 from The Hampton Court Palace Flower Show 2011.
and pictures with Stacey Solomon. 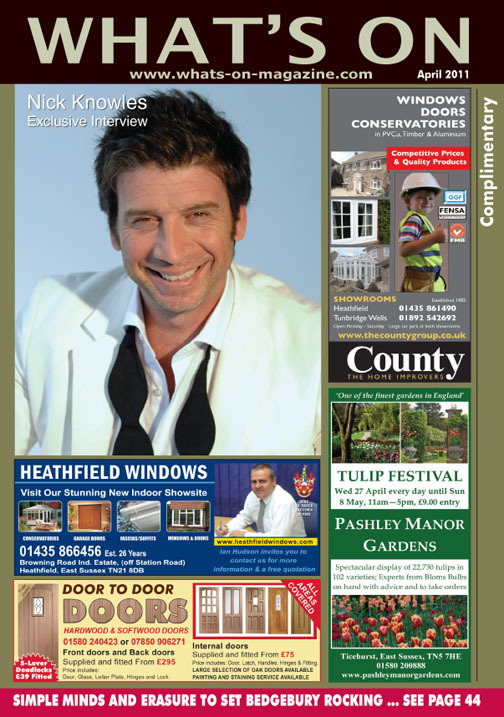 and pictures with Nick Knowles. 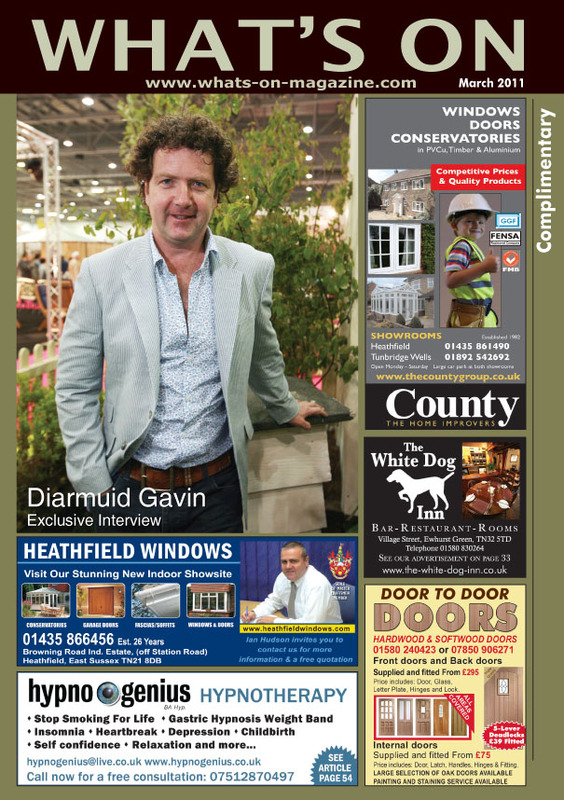 and pictures with Dirmuid Gavin. 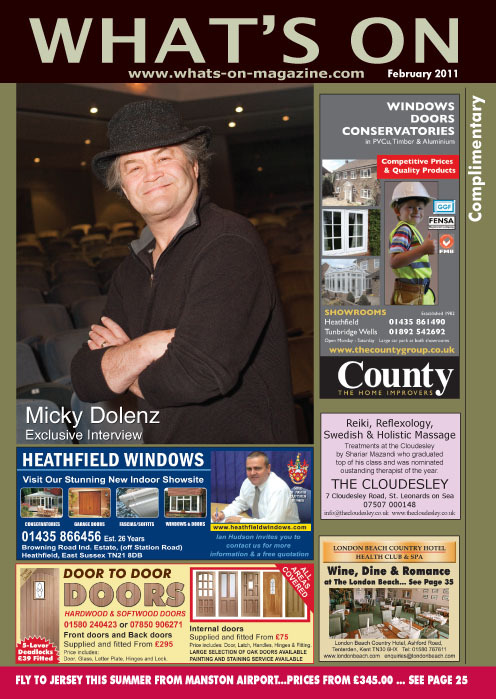 and pictures with Micky Dolenz. 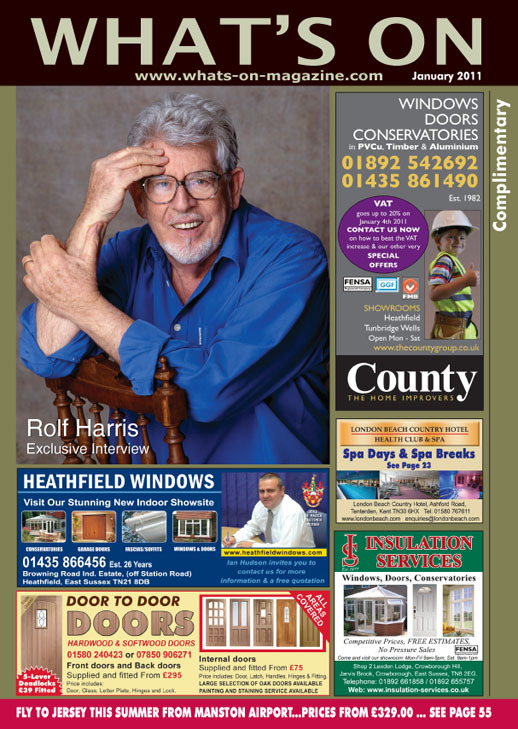 and pictures with Rolf Harris. 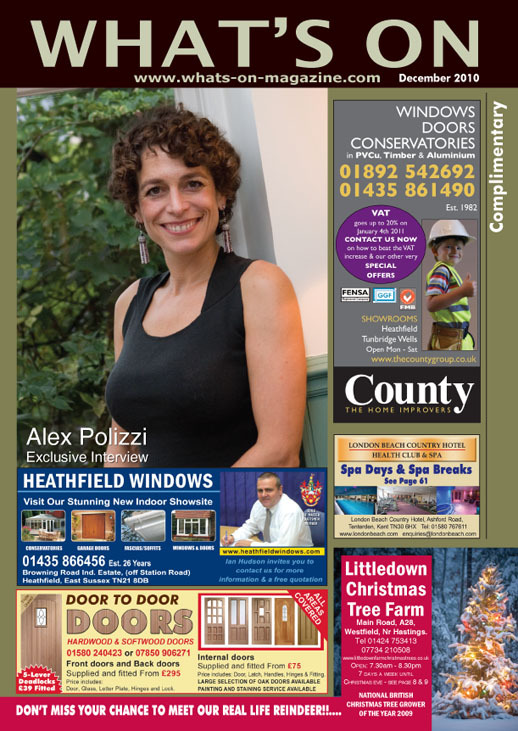 and pictures with Alex Polizzi. 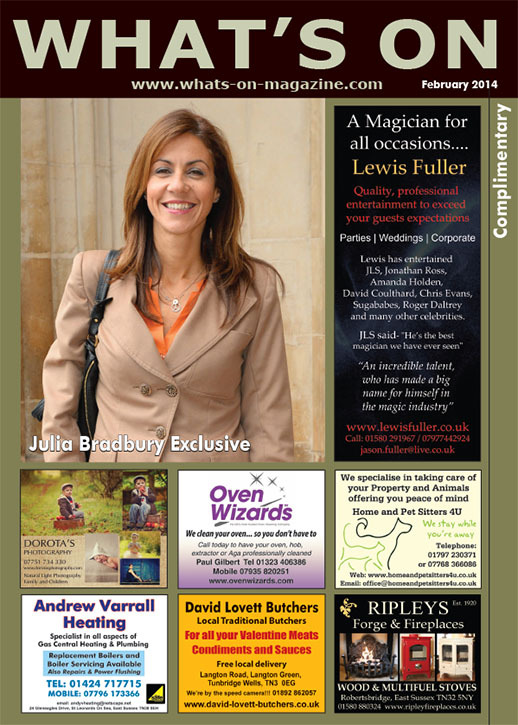 Click on the pictures to read the magazine online. 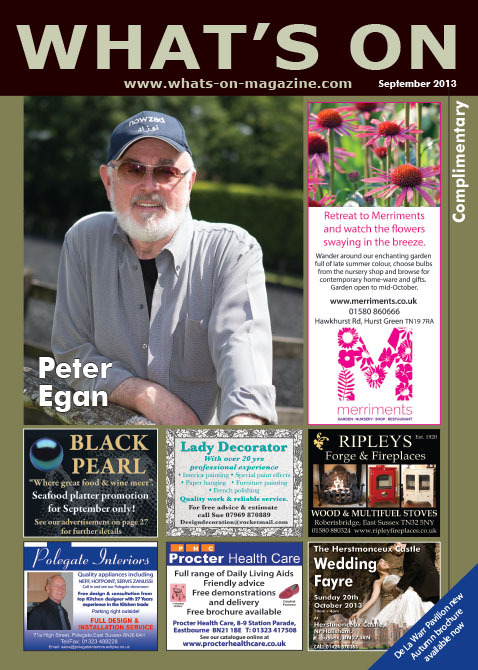 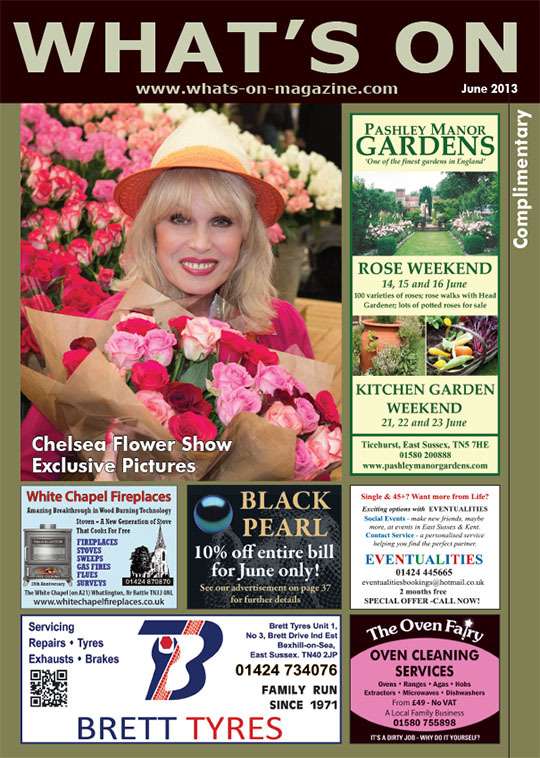 Just click on the picture to read the magazine online. 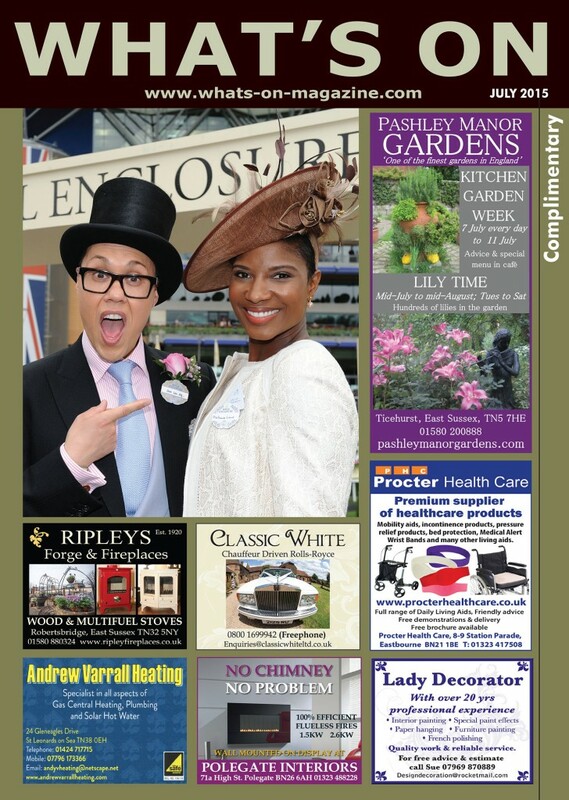 from The Hampton Court Palace Flower Show 2010.
from The Chelsea Flower Show 2010.
and pictures with Ching-He Huang. 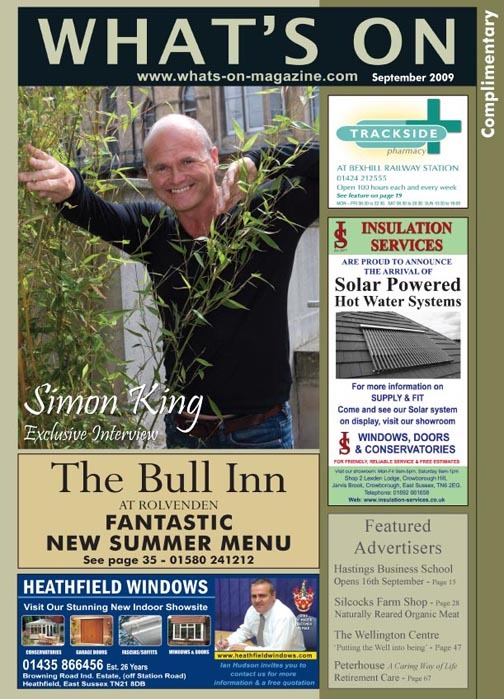 and pictures with Simon King. 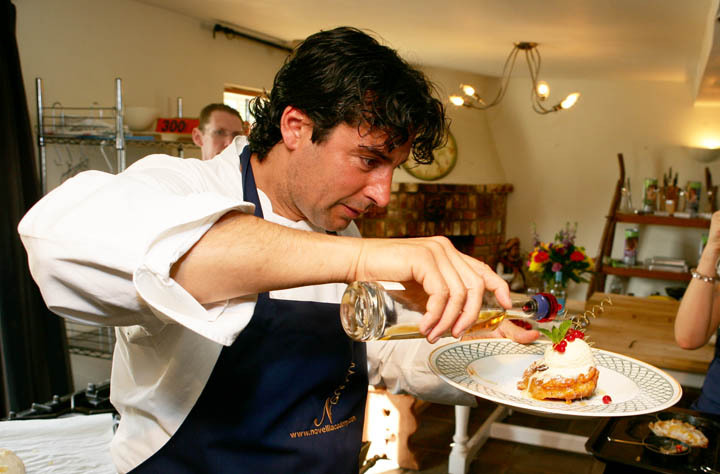 from the Hampton Court Flower Show 2009.
from the Chelsea Flower Show 2009.
with clebrity chef Brian Turner. 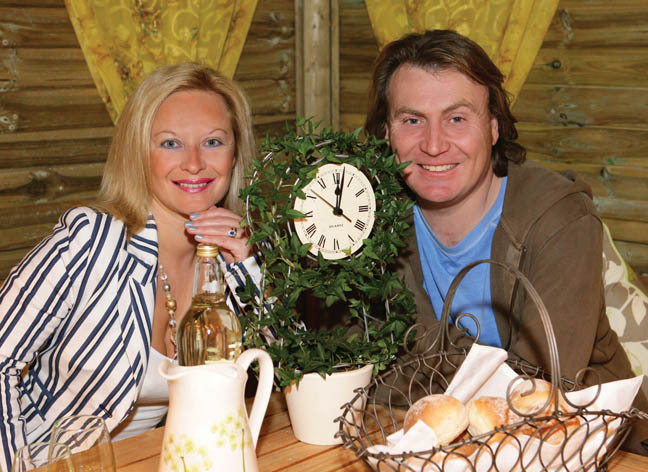 with Michelin Star Chef Richard Phillips. 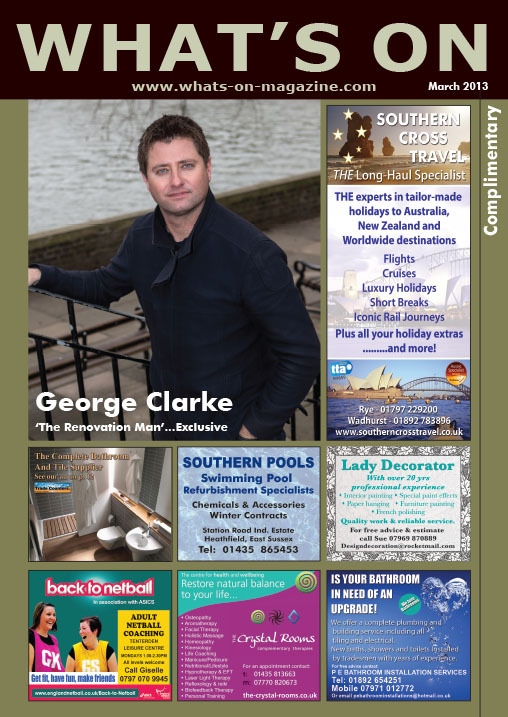 withÂ travel writer & broadcaster Simon Calder! 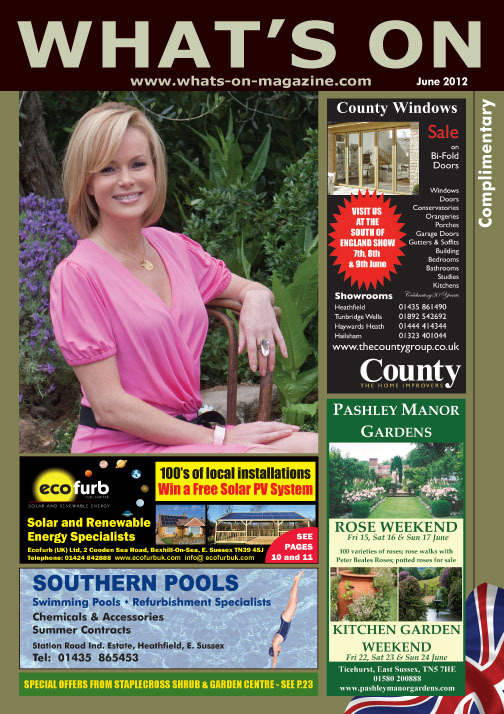 with Erin Boag from Strictly Come Dancing! 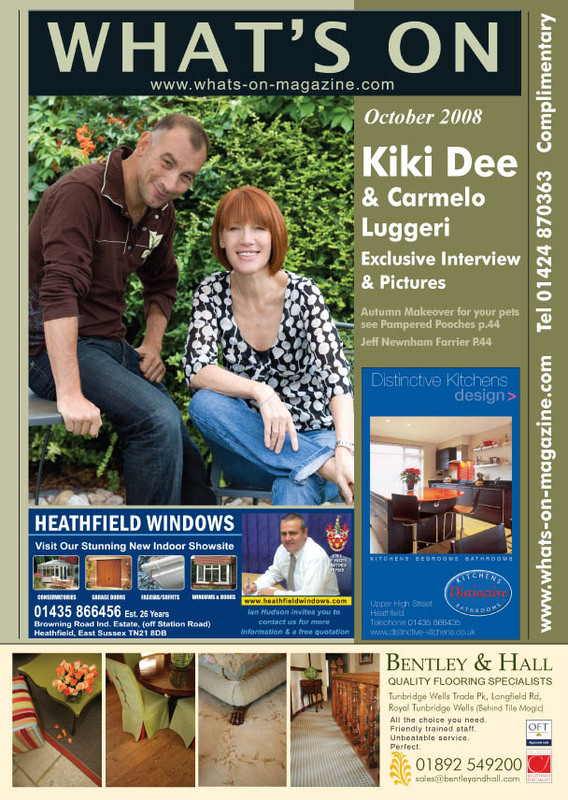 with Kiki Dee and Carmelo Luggeri. 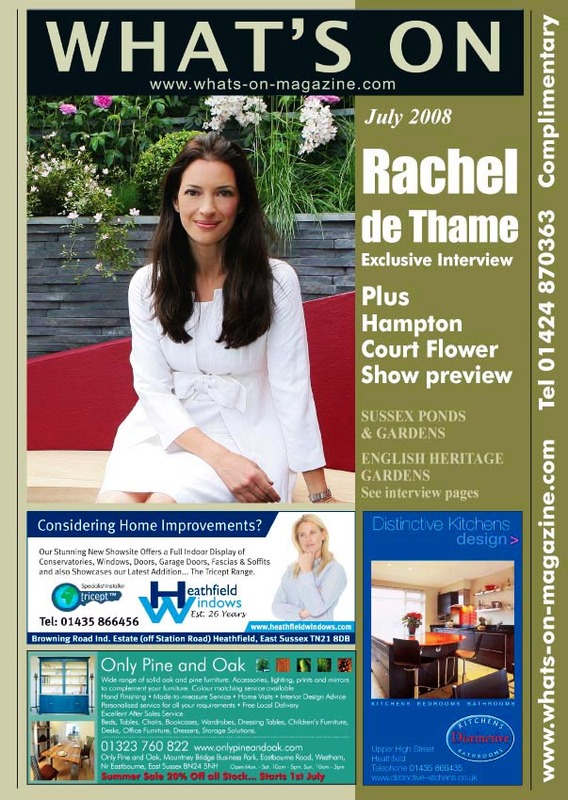 withÂ Rachel de Thame and a Hampton Court Flower Show preview. 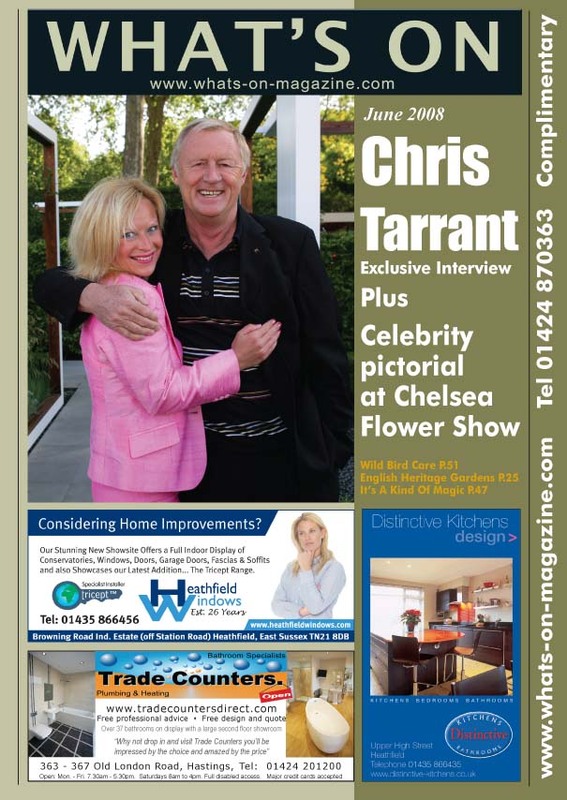 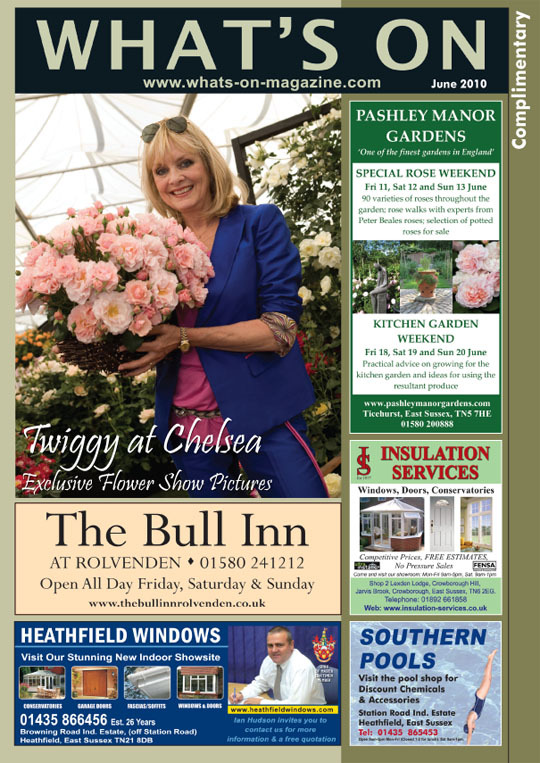 with Chris Tarrant and a Chelsea Flower Show Celebrity pictorial . 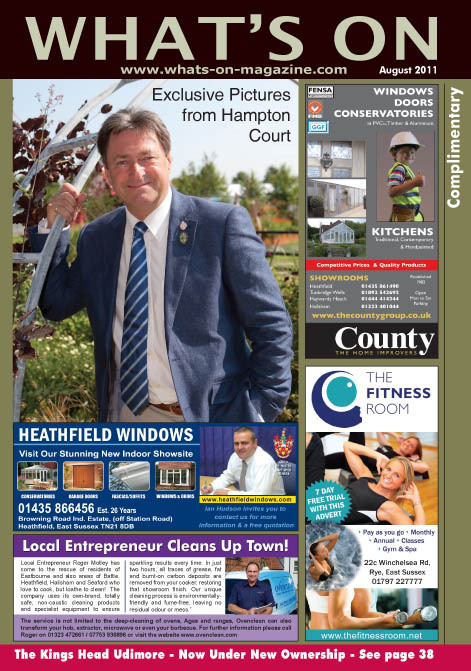 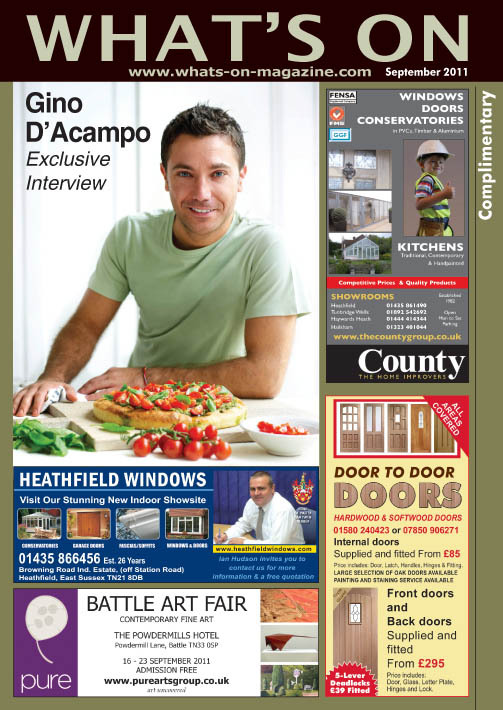 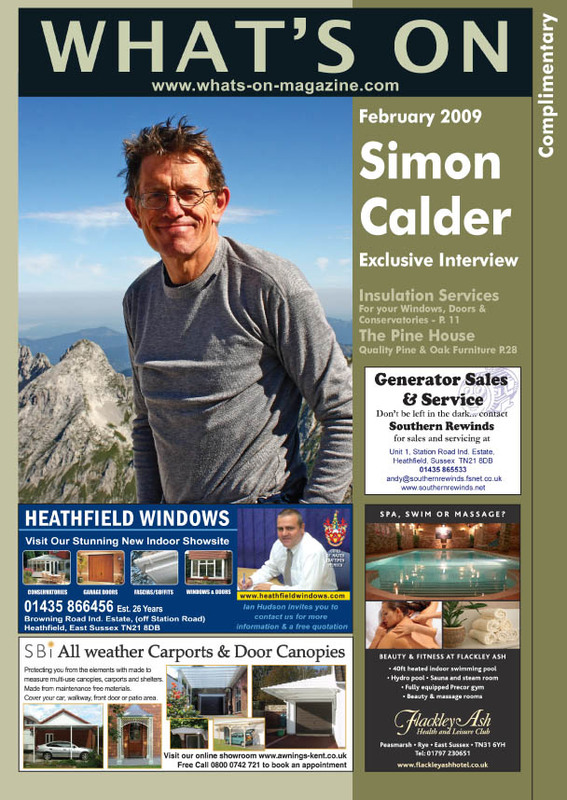 Our February 2008 edition features an exclusive interview with Colin Fry. 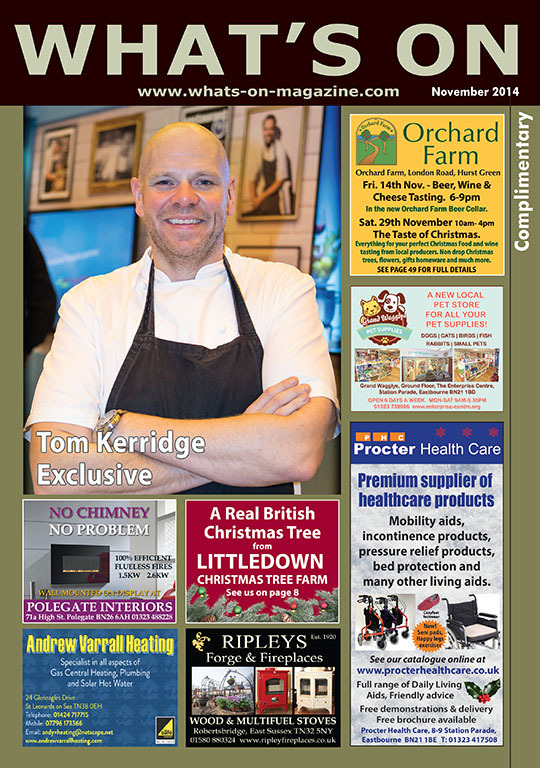 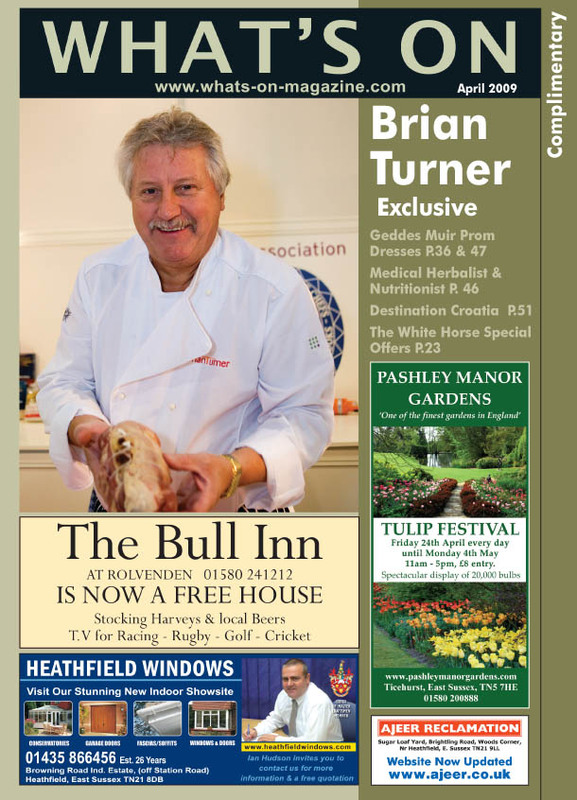 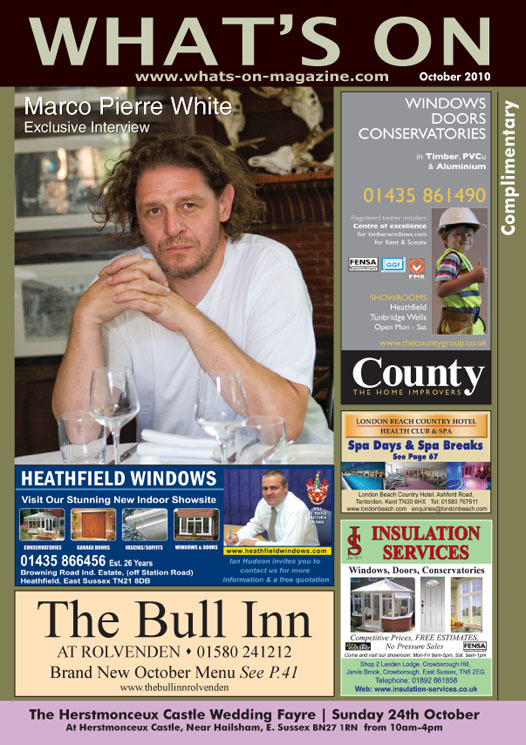 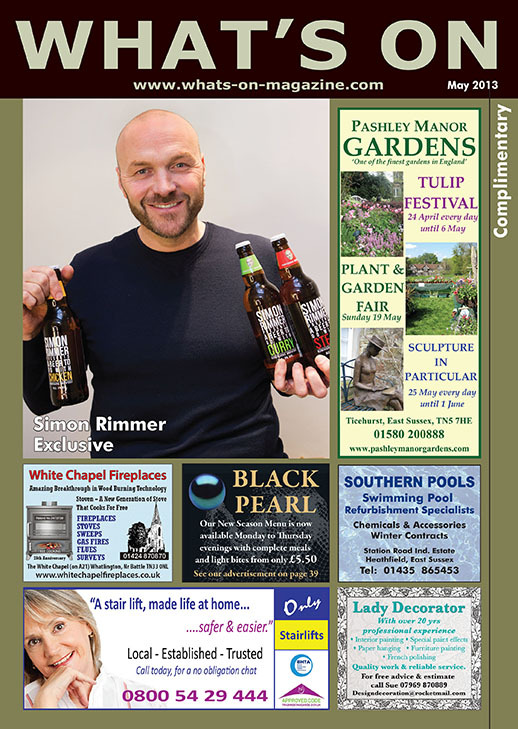 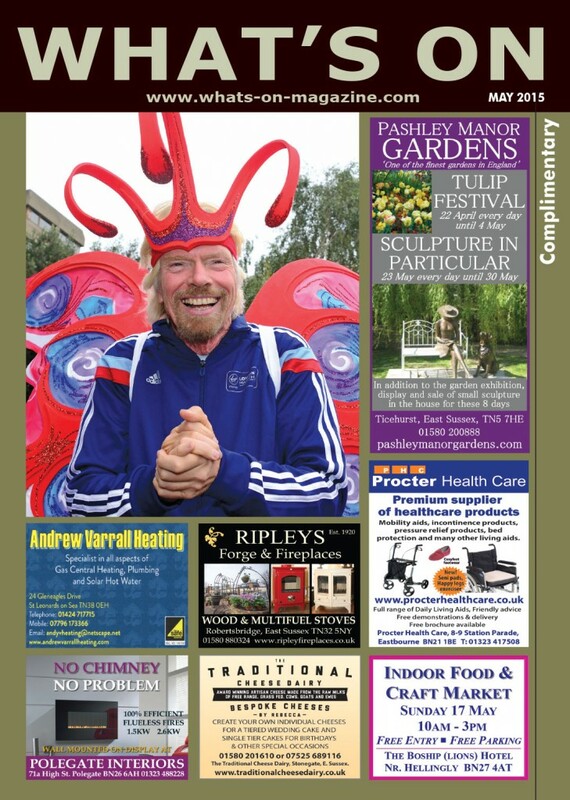 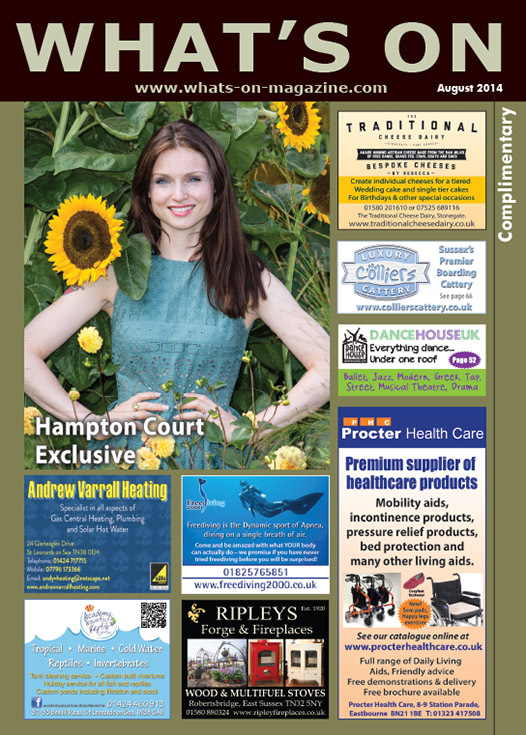 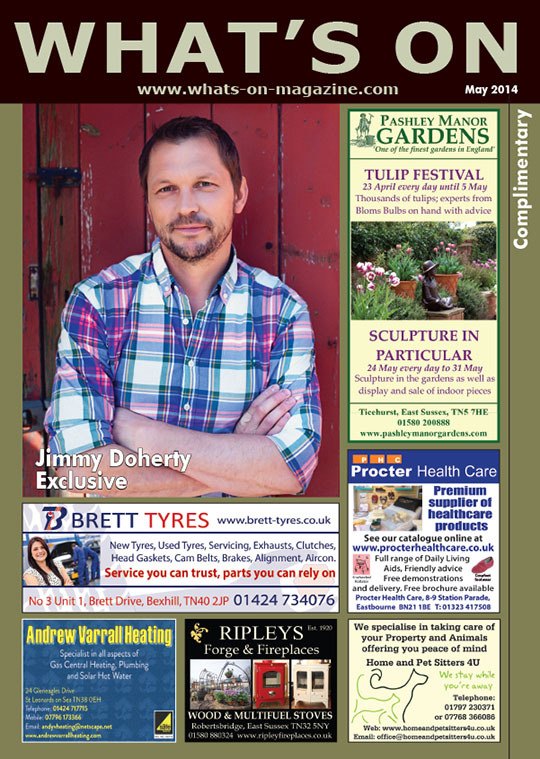 Our October edition features an exclusive interview and pictures with Antony Worrall Thompson. 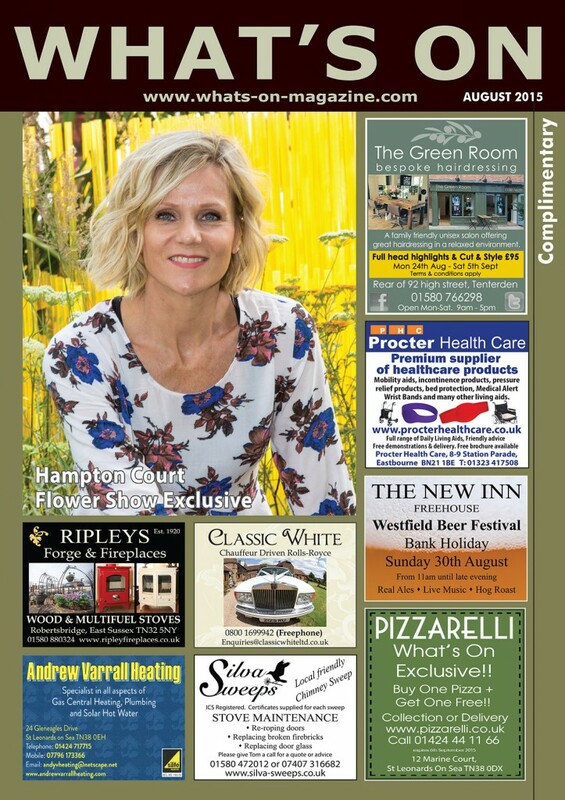 Our September edition features an exclusive interview with Claire Goose. 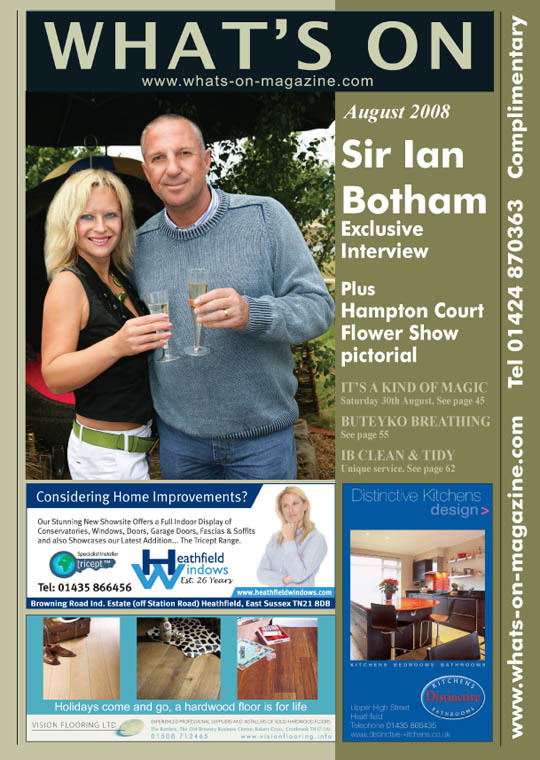 Click here to listen to the Simon MacCorkindale interview.